Yesterday when I posted about my failing vision as a sign of age, I forgot to mention the other unfortunate symptoms: I somehow injured my neck in my sleep the other night and am at this very second wearing an ice pack over my shoulder to help with the shooting pain. Also, this morning I went to the doctor to see about my ailing foot. I was right in thinking it was plantar fascitis, but do you know what's CAUSING that ridiculous condition? It's arthritis in my big toe joints. And failing vision and a tweaked neck. The good news is the PF is treatable and the doc had no doubts about me training for and running Boston. He did, however, say I had to wear different shoes. "Do you have a job where you're on your feet a lot?" "Um, yes," I said. "I'm a teacher. I'm on my feet all day." "Yeah," he said. "Well, I'm going to recommend shoes with a hard, rocking bottom. Do you know Danskos?" Do I know Danskos? The shoes I wore daily for several years until I embraced fashion? Until Tim Gunn told me via national television that my clogs were "the homeliest shoes in the world"?! "I do know them," I told him. "I wore them all the time until Tim Gunn said they were the homeliest shoes in the world." He looked unphased by this comment and basically said, "Do you want to run your marathon or not?" "Okay," he said. "I'll give you a coupon for Schuler's." Schuler's. You guys, that's the orthopedic shoe store. Where the old people with their walkers go. Also, people who are only allowed to wear clogs. People with arthritis in their toe joints. "They carry both the clogs and the berry-colored SuperFeet insoles I want you to have," Dr. L. continued. Super. I can't wait to go there. I was getting some housekeeping done while my students were watching the first 35 minutes of Gary Sinise's Of Mice and Men. It was hard to do all the work by the light of my computer, but I was determined. One of my tasks was sending heads-up emails to the kids and parents of those kids who failed the first quiz on the novel. I looked at George's score: 3.5/10. I'm concerned, I wrote to George. Let's kick it into gear. Later when I turned on the light, I found that George actually earned 8.5, not 3.5. It was hard to see in the dark. Plus, I'm getting old. I looked through the Friday Folder today and came to find out that Mac's been experimenting with different ways to write his name. "Did you write 'Mr. Mac?'" I asked. "Yes," he giggled. "I like to do that." Mac did this tonight. FYI. Cup stacking. It's a thing. The song in this cool video is by a band called The Killers. The song is called, "All These Things That I've Done." This video was introduced to me by my stellar teaching partner. That partner and I have the same name, which starts with K. Also, we each have two boys. We each gave our boys last names as first names. We also married guys who went to the same school and grew up in the same neighborhood. It's weird, kind of, but it's also fun. Good news: Mac's started Writers' Workshop. His teacher showed us his first two pieces at his conference today. The first one was about how happy he was when we got our dog, Skip. The next one was really impressive. It was about how he either wanted to view the Olympics or compete in the Olympics. He even drew the Olympic rings. And, you can imagine my joy when Mrs. V. told me about how Mac already understands revision. "After he wrote this, he came back to me and proudly showed me how he changed all the CSs to Xs, because it's O-lym-piX." My own kids and I were walking through the middle school the other day after school, en route to tae kwon do class. "We're headed to tae kwon do," I told my boss and a passing colleague, smiling. "Do you do that with them?" my boss asked asked, stopping to chat. "Oh no," I said, chuckling. "I just sit there using the free internet." "She grades," explained my colleague. "Well, I wasn't sure," my boss qualified, pantomiming some punches. "I'm just not the type of person who would succeed at tae kwon do," I said. "Can you see me, like, sparring?" "Oh, I can totally see it," said my colleague. "Really?" I said, wrinkling my nose. I did a side kick and asked a nearby student, "Hey, Alex, could you see me doing tae kwon do?" "See?" I said to my colleague. "Oh," she said, "I didn't say I thought you'd be GOOD at it. I think it would be really funny, actually. It just seems like something you would do." I've been having some trouble with my right foot. It's plantar fascitis. I'm pretty lucky to have never had this bane before, but I do have it now. I've been pretty stupid about it, unfortunately. I haven't taken it that seriously; I've been negligent on the stretching. I've kept running, even though it hurts. Now, I'm making a solemn vow to discontinue this ridiculous behavior. I will wear inserts in all my shoes. I will take another week off of running. I will take my anti inflammatories. I will stretch and strengthen my feet. Basically, I will use common sense instead of just sort of vaguely hoping the PF will resolve by magic. Tough question to answer this morning on the way to school. The boys just got their hair cut short and spiky which emphasizes a certain family trait. Shef: Mom, do my ears stick out? Shef: Do my ears stick out? Me: Well... [deciding to abide by philosophy of honesty] I'm sorry to tell you that all of our ears stick out. You get it from me. Super sorry. Mac: MY ears don't stick out. Me: I love your ears. Your ears look great. You might want to just listen to that as you read the rest of this post and imagine me playing that piece in my living room. So, this week, Jennifer gave me some Suzuki Education about Listening. Did you know that if you listen to something three times a day for eight days in a row, you basically have it memorized? This is important to me because Jennifer makes me perform everything from memory in order to get my stickers, which are supremely motivating for some embarrassing reason, even though I'm 35 years old. Besides listening to the Suzuki repertoire with frequency, Jennifer said I'm also supposed to listen to other stuff on a regular basis. "Like, are you listening to jazz?" Jennifer asked. "Are you listening to bluegrass? Are you listening to other high quality classical recordings?" "You mean like Katy Perry?" I asked. She gave me a blank square. "Call Me Maybe? One Direction?" "I have heard of Justin Bieber," she admitted. September is now over, and it's time to get real. We can no longer be frantic 100% of the time. That September CRUSH is not sustainable. Finally today, I looked at my desk and realized I had nothing I needed to race to accomplish. I could take a deep breath and focus on the exhale. I could send some "good news" emails and catch up on my reading for Teachers of the Future. Tomorrow, I can still teach about adjectives, and everything will probably be fine. 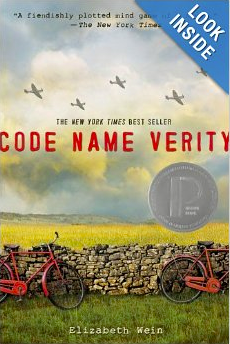 I'm listening to a fabulous audio book called Code Name Verity. I'll be honest and tell you that I found the beginning to be a bit slow. I probably would have quit reading it if I were using a paper copy. But, the audio version is performed by Morven Christie, a Scottish gal with a sweet voice and an appealing brogue. I still have a few hours of this book left. By this point, I'm 100% engrossed in the plot and invested in the narrator, Queenie. I'm pretty sure there are going to be some twists and turns.